To accompany our popular 'Artist Spotlight' feature, ACS is introducing a series of interviews with recipients of the charitable awards we have presented in collaboration with arts universities throughout the UK. The first student to be featured in this series is Emily Tapp, winner of the ACS/Falmouth Materials Prize 2017. Currently in her second year of study at the university, Emily will receive a £1,000 bursary to contribute to the cost of materials in the final year of her undergraduate degree. Winning the ACS/Falmouth Materials Prize will allow me to push my practice in my third year in ways that, otherwise, I would find limiting. In my final year I wish to pursue the genre of land art with a greater intensity, really exploring alternative methodologies of making works in and about the landscape. This award will make an immense difference to my third year practice as it will allow me to push my ideologies without worrying about means of funding experimentation. I wish to pursue the art of natural colour even further next year, using minerals and other materials to make organic, raw and historically enriched hues. To do this I will need to fund a collection of specialist tools, whereas I am currently using kitchen saucepans as my dye-pots. The prize also confirms funding for a self initiated residency of sorts, later this year, for me to completely immerse myself in a foreign landscape and make work within it. Q. Were you familiar with the importance of either copyright or Artist’s Resale Right prior to ACS’ talk at Falmouth? Although I was familiar with the importance of copyright, I was completely ignorant of the Artist’s Resale Right prior to attending ACS’ talk. I also made sure to state copyright on each page of my website straight after the talk had finished – it was something I had completely overlooked when first putting the site together but is incredibly important as I go on to begin a career in the art world. I am working towards a practice where most, if not all, of my process is informed and facilitated by materials from the natural world. Recently I have been exploring the extraction of colour from plants, flowers and organic materials. 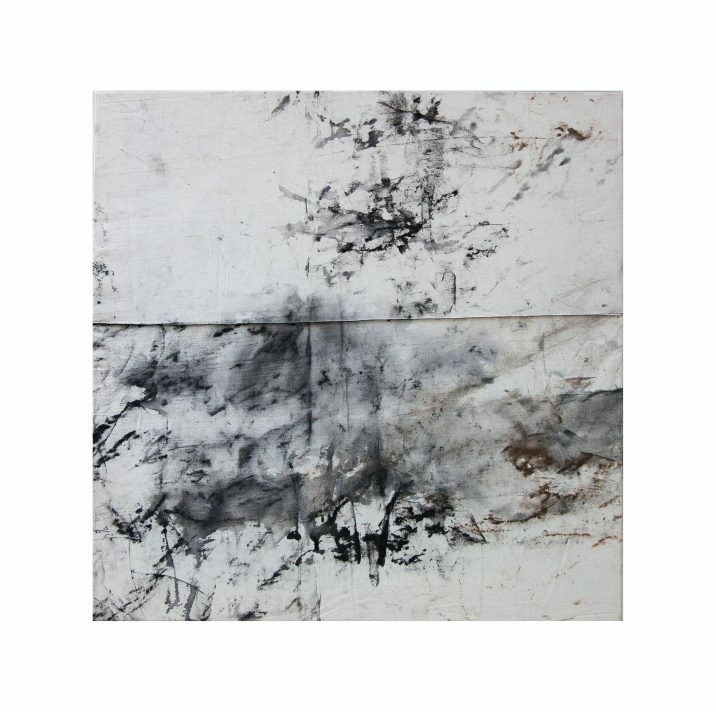 I also take tracings of the ground, rocks, trees and textures surrounding the sites that I make work in and about – I currently use graphite and charcoal to do this, but I am researching new processes that will allow me to make my own charcoal from materials found around my sites for this purpose. I work primarily on linen, hand-stitching panels of the fabric together before stretching them over canvas supports upon completion. Of late I have become interested in the women’s movement and the subsequent consequences it has brought about in contemporary feminist art. The use of fibrous materials by women has been recognised in our history for a long time, but it seems to have had some sort of awakening recently. Recognising the artistry behind traditional ‘women’s work’ is something I strive to explore further in third year. I plan to begin this exploration with a portion of my ACS/Falmouth Materials Prize to purchase a loom, so that I can begin learning about and making weavings with yarn that I have naturally dyed with plants and organic materials sourced from the Cornish coast. Living in Cornwall whilst at University, it is difficult to not be inspired by the incredible landscape. I’m drawn to tactile processes and my current practice allows me to get out in nature, to get to know the landscape in a very intimate way. I feel great joy from being outside, foraging for dye materials, walking, taking rubbings of the earth beneath me, photographing intricate details, feeling the rocks and crevices and letting the field sites’ characteristics dictate the work that I make. My studio practice is a reflection of the awe-inspiring moments I have had outdoors, translating these experiences to personal and visual ‘maps’ of places. and natural fatsia japonia seed head dye on linen. My process begins in the studio – reading and gathering information to back up the theory behind my works. I am consistently thinking about ways to ask questions about what I’m doing and why I’m doing it. I place a big emphasis on field work in my working process. I go out to designated field work sites and immerse myself in the landscape, making frottage traces of the topographical surfaces, collecting materials such as gorse flowers or seaweed for making natural pigments with. Taking my gathered materials to the studio, I piece together a considered curation of a place in each piece. Panels of linen are hand-stitched together, raised stitched seams running through the linen landscapes. 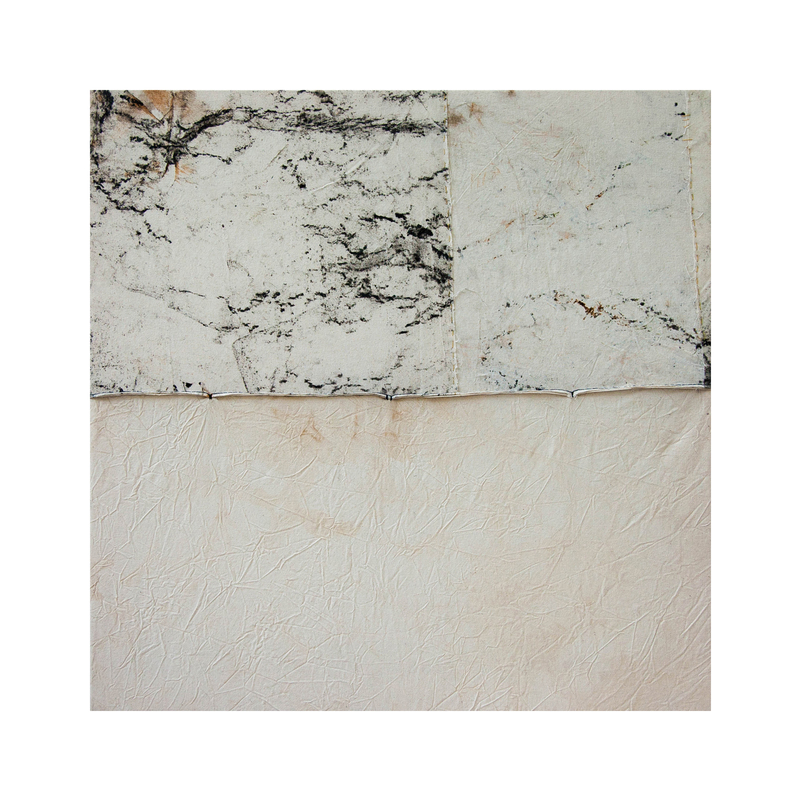 The frottage is a direct impression, abstracting landscape in its imagery, recording time in place. The naturally dyed fabrics allude to the temporality of a sense of place – different organic materials grow and are abundant at different times of year and because of this I am drawn to visit the same place, every few months, watching how my work changes with the seasons. For example, my first trip to Swanpool Headland in November of 2016 rewarded my dye pot with fern leaves, beech leaves and seed heads – producing shades of orange, burnt umber and brown. My second trip, at the beginning of Spring, left me collecting gorse and cow parsley – imbuing the fabric with vibrant shades of yellow. The first work that I remember being happy with as an ‘artist’ was made during my second year of A Levels, a multi-media installation titled ‘Bursting With Knowledge’. Inspired by the work of Cara Barer, Klari Reis and Charlotte Hupfield, I worked with ceramics, sculptural elements and the theme of scientific objects. My final piece consisted of a series of book sculptures – manipulated by rolling, curling and securing the pages to end up with spherical elements akin to Petri dishes – representing the scientific books that mankind have compiled from our discoveries. Test tubes filled with bright paint hung from the pages of the books and ceramic circles imitating bacteria growing in Petri dishes were mounted on the wall, representing the ‘knowledge’ literally cascading from the page. It was a turning point for me and a project that led me to think seriously about studying Fine Art at university level. I think the work was so memorable because I placed such an emphasis on the conceptual drive behind the project.